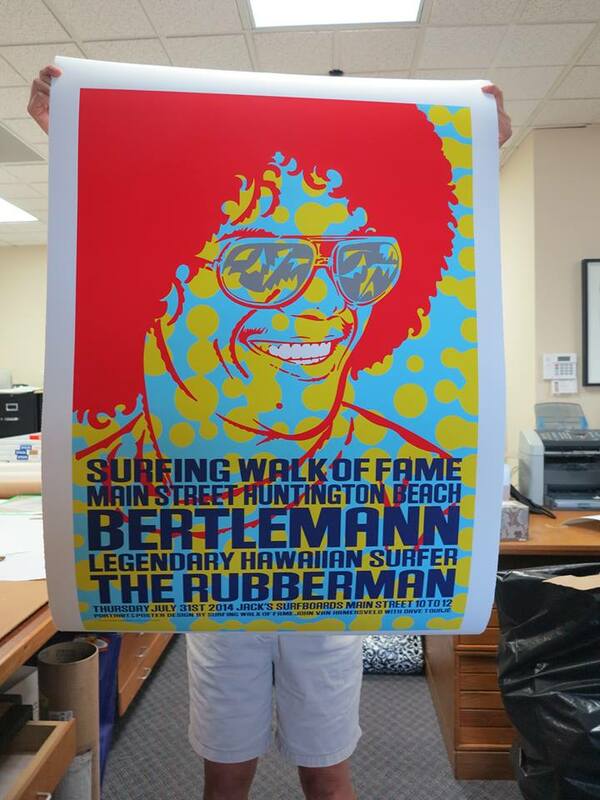 Event: Surfing Walk of Fame 2014 Huntington Beach, CA., July 31, 10 a.m. Legendary artist John Van Hamersveld and surfing icon Larry Bertlemann, aka, “The Rubberman,” have at least two things in particular in common – they have each pioneered a new and completely original way of looking at the world, recognizing in their respective fields the possibility for change and innovation, AND, they are both being acknowledged for it by being inducted into the Surfing Walk of Fame on Thursday July 31st, 10 a.m. at the Main Street, Huntington Beach ceremony. Artist Dave Tourjé, the catalyst behind this poster project explains the inspiration for it: “After becoming friends with Larry Bertlemann’s wife Karean on Facebook, I started thinking about how influential Bertlemann has been on not only surfing, but skateboarding and the entire extreme sports world to present day, whether all the kids know it or not. I told Karean how profound his impact was on anyone involved in those worlds, and next thing you know, she sets up a surprise conference call with him – one of my heroes growing up in the ‘70s as a surfer/skater”. After this call, Tourjé, himself known as an L.A. art innovator (L.A. Aboriginal, California Locos, etc.) explains that he envisioned a classic surf/rock poster of Bertlemann in the vein of Van Hamersveld’s classic rock imagery of iconic rockers like Jimi Hendrix, The Cream and John Lennon, and that Van Hamersveld was the only person that could do the project. Tourjé’s own deep involvement in early vertical skating, snowboarding and surf gave him a decisive understanding: “John and I have been friends for years and I realized that though he is so deeply associated with surf culture with the Endless Summer image, Clark Foam logo, etc., he has never released a portrait of a surfer in the vernacular of his historic rock and roll portraits. I thought this was the perfect opportunity for his first, so I pitched it to him and he dug the idea. I picked out the photo and Larry gave us the rights to do it, so it was over to John”. Inspired by Bertlemann’s influence on vertical skating as well as his own deep connection to the surfer/skater movement of the ’70s, Tourjé recognized the power and influence of Bertlemann’s image as culturally iconic and simply ran with it. 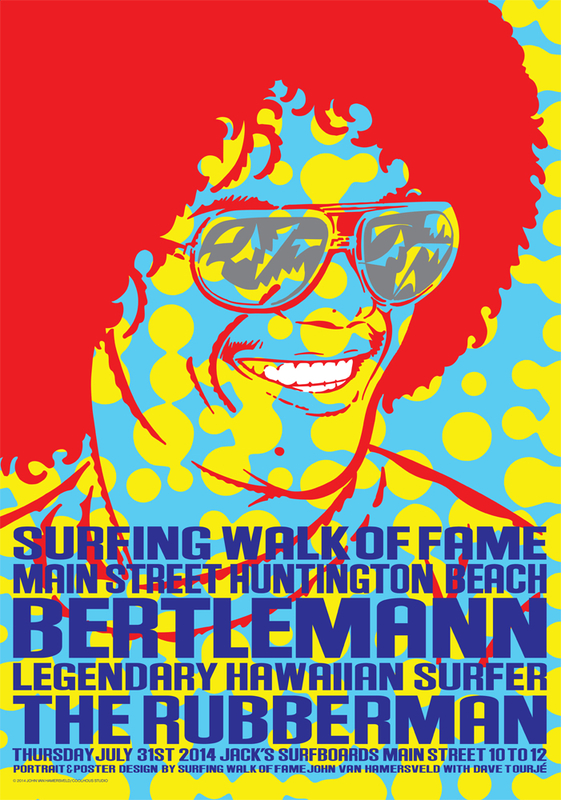 In honor of Larry Bertlemann and John Van Hamersveld’s induction into the Surfing Walk of Fame this year, Tourjé imagined Bertlemann as the “Jimi Hendrix of Surfing,” and approached Van Hamersveld, himself an iconic figure in the world of graphic design, to propose the idea for a groundbreaking poster of a Bertlemann portrait, an image that follows roughly the same graphic architectural style as Hamersveld’s famous Pinnacle Hendrix poster of the 1960s. Van Hamersveld explained recently that “Bertlemann’s energy, positivity and winning smile were the driving elements in bringing this all together”, and created a classic poster with vibrant colors as the perfect embodiment of Bertlemann’s vital energy and influence. The project includes a run of T-shirts and a Limited Edition of 100, size 19” x 28” posters produced by Andrés Cuervo and N.E.L.A. Clothing Company, printed by David Mayes and Typecraft Wood and Jones who’ve created posters for Robbie Conal, Shepard Fairey as well as Tourjé and many others. In addition, Nash Editions will be producing an edition of 50, at 28”x40” printed on Moab Entrada cotton rag fine art paper. The project combines Van Hamersveld’s versatility and revolutionary graphic style with Bertlemann’s progressive vision on the water, and represents the first time Van Hamersveld has released a quintessential graphic portrait in the world of Surf, though he has produced many other things such as his recent “Pipeline Wave”, which was shown at the Cal State University Northridge Gallery in 2013. Amazingly, Van Hamersveld’s Endless Summer image celebrates its 50th anniversary this year and has become the key graphic that symbolizes an incredibly influential cultural moment in California history, while Van Hamersveld’s contemporary presence in the surf world remains strong to this day. Tourjé, Van Hamersveld and Bertlemann focus entirely on individuality, progression and innovation. “I surfed for myself and the public, not for five judges,” Bertlemann has said, and this attitude of generosity and accessibility between all these three is what marks this event as landmark. This is truly a collaborative project on many levels and Tourjé and Van Hamersveld have been working together on graphic and conceptual collaborations since 2002 including the Chouinard Foundation and most recently the CALIFORNIA LOCOS exhibition which also includes graffiti legend Chaz Bojórquez and iconic artists Norton Wisdom and Gary Wong as well as Tourjé. Bertlemann’s influence on surf culture extends well beyond the world of Surf to encompass an entire generation of “vert” skateboarding heroes including Jay Adams, Stacy Peralta and Tony Alva, all of whom drew from Bertlemann’s pioneering surfing repertoire, distinguished by “low gravity cutbacks, 360s and switch-foot antics that were spontaneous, yet completely functional”. Bertlemann also utilized the short board in ways that were then considered unimaginable. Like Bertlemann, Van Hamersveld created his own electrifying visual language and this singular event is both a celebration of Bertlemann’s iconic style and also constitutes Van Hamersveld’s legacy of a far-reaching generational vision that is as contemporary and vital today as it was in the mid 1970s. That these two legends are being inducted into the prestigious “Surfing Walk of Fame” on the same day is fitting. That Van Hamersveld has created a surf portrait of Larry Bertlemann during the 50th anniversary of the most important image in surfing – the Endless Summer – is both telling and timeless.